Josh Berman never expected Janet Yellen to respond. The first-year emailed the former chair of the Federal Reserve about a project he was doing for Professor Bruce Caldwell’s Freedom and the History of Economics class. The first email he sent to an address he found online bounced. Caught off guard, Berman asked if he could call Yellen back in five minutes. He rushed down to his professor’s office, where Caldwell was on a call. After explaining the seriousness of the situation, Caldwell hung up and the two brainstormed some ideas of what to ask Yellen. Feeling a bit more confident, Berman called Yellen back. He explained the project, which was a mock late-night TV interview, where Berman would dress up and pretend to be Yellen. His partners would play the host and interview "Janet" about her life and work. Yellen talked to Berman for nearly a half hour, giving him tips on everything from her time at the Fed to her mannerisms. Serving looks that would make RuPaul herself proud, Berman donned a grey wig, black suit, and a scarf for the presentation. Yellen approved of the characterization. After seeing photos of Berman dressed as her, she responded, “I’m delighted that the presentation went so well. Congratulations. And, yes, you do look a lot like me—at least insofar as a 6’1” guy can look like a 5’0” woman. 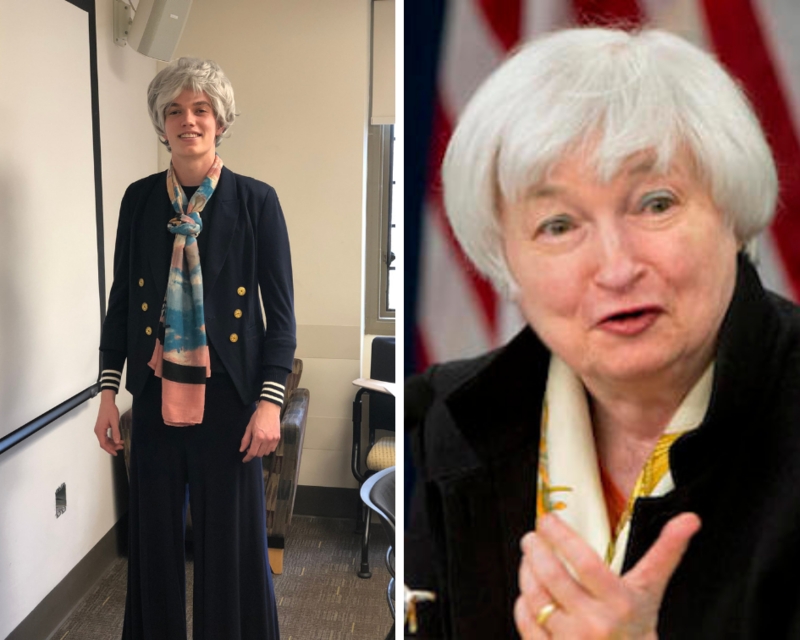 But you definitely capture the type of clothes that I wear.” To top off the already surreal experience, Yellen extended Berman an invitation to meet with her next time he was in Washington. And of course, Berman and his group received an A for the project.